[Josh] posed an interesting challenge. Create a boost converter that can light a blue LED using a nearly dead battery and one part. Well, we were skeptical until we saw he wasn’t counting an ATtiny processor as a part. You can see a video of the challenge, below. The challenge has already been solved, so if you view the link, you might want to avoid the comments until you’ve had time to think about your own solution. We’ll confess, the first one we thought of was probably not workable for reasons [Josh] explains. The final answer neatly fits the criteria of a hack. [Rick] knew that the blinking, beeping microcontroller kits that are commonly used for educational soldering workshops just would not cut it for a serious combat among SMD reworking professionals. The “Soldering Challenge” he created to fill this gap is a little PCB with eight difficulty levels from large through hole components to the smallest hand solderable SMDs. 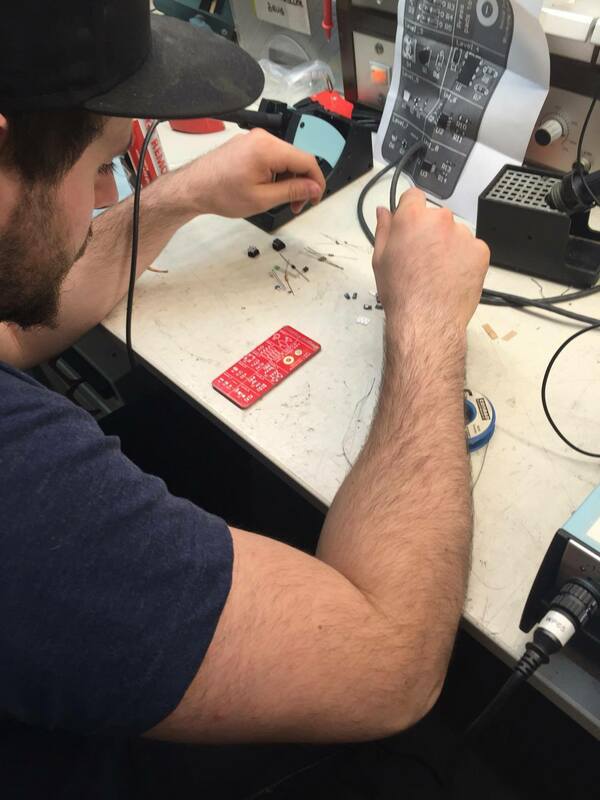 After assembly, the circuit assesses the skill level of the soldering aspirant based on a built-in scoring system. The challenge is meant to be played on a time limit. There are no two same-sized components of different value, so contestants may focus on soldering fast. Little rubber pads on the backside of the board provide for good ground contact in the curves. After the starting signal, you will be confronted with a few through hole resistors, a capacitor, different LEDs and a DIP-8 IC. Here it’s all about the speed and efficiency as you tackle a track full of bends and cut-off resistor legs. Over the course of the challenge, the components get smaller and smaller, until you finally reach the 0603 level, with a tiny SC-85 MOS-FET and a TSSOP 555 timer at the finishing line. Hot on the heels of the 2015 Hackaday prize, with its theme of “Build stuff that matters”, comes another opportunity for hackers to make a difference. But you’ve got to think like Mother Nature for the 2016 Biomimicry Global Design Challenge. The aim of this challenge is to transform the global food system using sustainable approaches that emulate natural process. Entries must address a problem somewhere in the food supply chain, a term that could apply to anything from soil modification to crop optimization to harvest and storage technologies. Indeed, the 2015 winner in the Student category was for a passive refrigeration system to preserve food in undeveloped areas. It’s a clever two-stage system that uses an evaporative cooling loop inspired by the way an elephant’s ears cool the giant beast, and by use of a wind-capturing funnel that mimics how animals as diverse as termites and meerkats cool their nests. In addition to the Student category, the challenge has an Open category for teams of any composition. Up to 10 teams will be selected from the Open category to proceed to the Accelerator phase, where they’ll receive support for a six to nine month development of their design into a marketable product. The winner will be awarded the $100,000USD Ray of Hope prize, endowed by the Ray C. Anderson Foundation. We’d love to see someone from the Hackaday community take home the 2016 prize, and there are plenty of 2015 Hackaday Prize entries that may be eligible. The deadline for submissions is 11 May 2016, so get a team together and get to work.